This is more of a comment on J. Lee Grady’s article read on Mario Murrilo’s Blog. Many Christians, including ministers, only listen to what they want to hear. A confirmation of the itchy hears of the last days, prophesied by Paul. A few times that I had pointed out in discussions where Hagin might not be totally correct, eyes rolled and faces changed as if I just insulted the spirit of grace. The humble Pa Hagin, and I respect him a lot, admitted that he made mistakes before in his teachings (check his work The Triumphant Church and some others), he even encouraged believers to read the scriptures for themselves (as you are personally responsible in the long run). There is no great name in modern day Charismatic movement that has never made a mistake, little as it might be. Some of the mistake can even be very serious. They get worse because people do not check things up for themselves since “our pastor is great, he makes no mistakes”. No wonder PAUL said how to do it is to come with fear and trembling (not with vain confidence and presumption often found with the theology of glory’ (a la Martin Luther’s Theology of The Cross and the Theology of Glory) which speaks as if all things are now perfectly seen as against Paul’s “… We know in part and prophesy in part ….”. The culture of the Berean church needs to be taught in our churches. We need to encourage believers to study the word and use it to confirm the things they are being taught. People should be taught to freely ask questions than to swallow what the father in the Lord is teaching hook line and sinker, fishing man and the fishing boat. 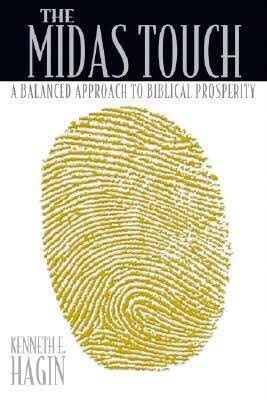 Many of Hagin’s so called adherents do not appreciate the Midas Touch. They read it without finding the corrections useful. Money is VERY good, but the love of it very subtle and very destructive. Money has subtly become the benchmark for assessment and praise all over the place. Many have returned to building up what they once pulled down. Many have read the book and they still boast of things that the Christian life is not basically about. Thank God for ministers who need and have afforded themselves of private jets. If our boast is in them because of their means of transportation then we should be ashamed because Las Vegas assembles more private jets when revellers from all over USA come together for their gigs. If the proof of the gospel is money, Paul was a failure and Dangote doesn’t need the gospel. Paul did not build a single edifice neither did he threw up financial figures in his homilies. The essence of the gospel is more than what people can get from elsewhere. It is about changed lives; it is about the walk with God; it is about commitment to the fulfilment if His will on earth as it is in heaven. If what we boast about and preach is what people have received without christ, the gospel will then be vain. Read the linked blog and if you can the book, The Mida’s Touch. They are worth reading. Bible had saith it all, the love of money is the root of all evil; Jesus Christ is all what we need as a true believer in Christ Jesus. We should learn to know the different between the things of God and the things of this world. And we should learn to be satisfy in whatever position we find ourselves and keep our faith in God and not on materialism for show up.